Edit: This can now be done in a GUI by using the OneDrive Admin Centre at admin.onedrive.com. It also allows Mac clients by default now. A quick preface to this post; making the changes listed below will stop all Mac clients from being able to sync their OneDrive, and will not stop mobile devices from connecting to OneDrive using the app. It also doesn’t stop the downloading or uploading of files from the web access of OneDrive. It’s sole purpose is to limit the functionality of the Windows OneDrive for Business sync client! Make sure you replace the GUID here with the GUID you copied and pasted earlier and this setting will lock down your OneDrive for Business synchronisation to client which have the same domain GUID. If you want to enter more than one GUID, separate them with commas. Hope this helps and sorry if it’s a bit of a haphazard blog post, it was written in a bit of a hurry! Now I’m not one to advocate turning features off in Office 365, but sometimes when deploying Office 365 for a customer, there is simply too much change at one time. And if there is one thing that users hate, it is too much change! Many customers I work with will choose to disable Skype for Business or OneDrive during the initial migration of email into the cloud. They can then plan the roll out of these services at a later date, and educate users on how to make the best use of it. This is much more preferable to just throwing a load of new functionality at users and expecting them to just start using it all with no training. After all, adoption of new technology starts with giving users the knowledge and power to be able to use the tools effectively! And on that subject is a feature which has baffled and confused some users. This is called ‘Clutter’, and it uses machine learning to help organise the email which you don’t look at regularly, but may not want to delete (for example, that weekly newsletter from exchangeserverpro.com). This mail is automatically moved into your Clutter folder, clearing up your inbox so that it contains the email you need to know about now! Email which is automatically moved out of your inbox does have the ability to freak users out if they aren’t expecting it, so you may want to disable this at first and then enable once you can communicate it’s purpose and usefulness to the business. To do this, you will need to make use of the mighty PowerShell! And look for the IsEnabled parameter, which should be set to False! So in summary, feel free to turn it off, but whatever you do, make sure you turn it on again as Clutter is definitely a useful tool to have in your email armoury! 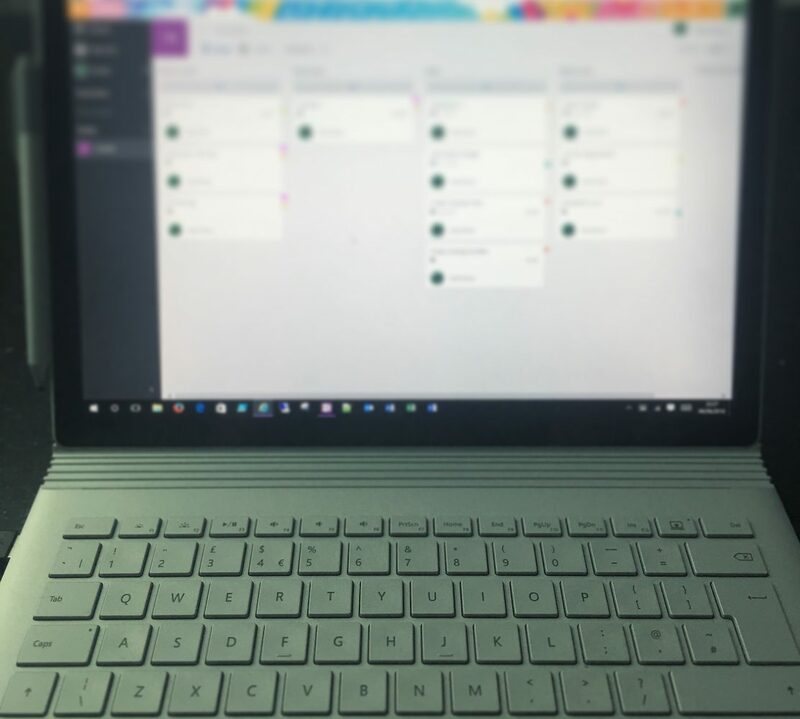 I just wanted to write and tell you all about a fantastic new feature built into the AAD Connect tool. It’s name is ‘Staging Mode’ and it has a dual purpose; a) it allows you to have a server which is essentially on standby, and b) it can be used just as it’s name suggests, in a kind of test mode where you can see what is being imported before it all gets sent off to Azure AD. Customer A has a functional installation of AAD Sync / AAD Connect which is synchronising objects and attributes between Azure Active Directory and the On Premise Active Directory. They then build an AAD Connect server in their DR datacentre (or wherever they fancy), and during the initial configuration, enable ‘Staging Mode’. Apart from this setting, they configure it just like their existing, live AAD Sync / AAD Connect server. They even leave the scheduled task enabled and running. All of a sudden, DR strikes, and the live AAD Sync / AAD Connect server goes offline forevermore, cast into the computer graveyard in the sky. Rather than restore the server from backup, they simply log into their second AAD Connect server and disable ‘Staging Mode’. This server then starts synchronising with Azure Active Directory in earnest, without having to miss a beat. What Staging Mode does is very simple. It acts just like a functional AAD Connect installation, except for the fact that it exports nothing to Azure Active Directory or your on premise Active Directory. It also does not perform any password sync or password write-back functions. The metaverse is fully populated and ready to start exporting data, giving you the easiest possible way to have a server on standby. 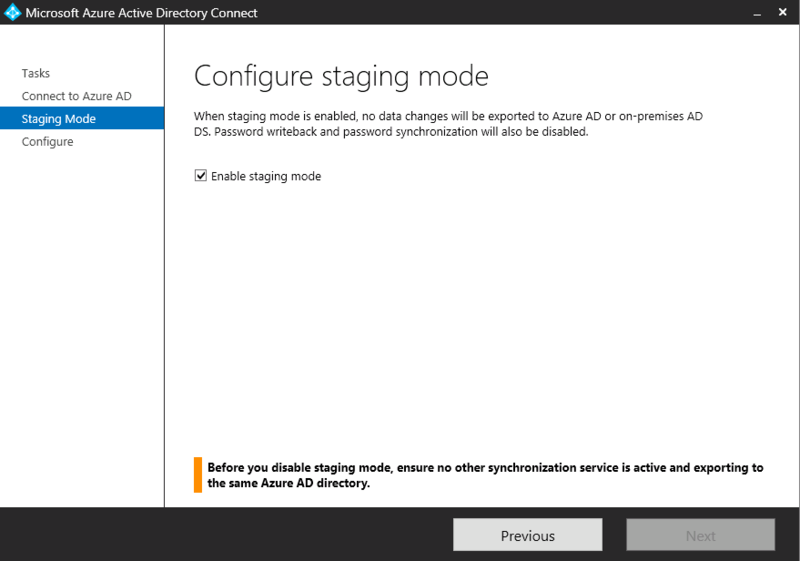 Unfortunately there is no replication between your two synchronisation servers, so any configuration changes need to be replicated manually, but this is another step to making AAD Connect fully HA, which is becoming much more desirable as Azure Active Directory gains traction. This blog post details the User Rights Assignments required for AADSync / AADConnect and the ADFS service accounts to allow them to do their thing! 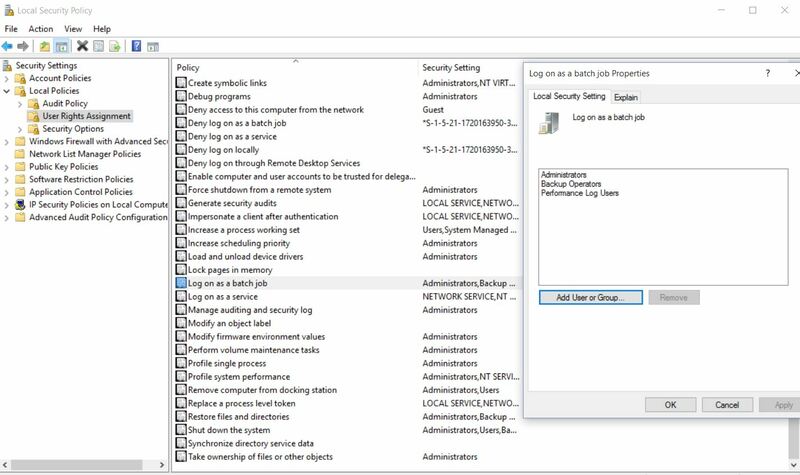 These privileges may be set on the Local Security Policy (secpol.msc) or may be controlled via Group Policy, depending on how your environment is configured. If you do come across any issues which look to be permissions based, please don’t just give the service accounts Domain or Enterprise Admin privileges! The reason we have service accounts is to limit the attack surface of any given application, and using the Domain/Enterprise Admin groups makes the whole concept of service accounts redundant. Anyway…. If you need to add a local account to a Group Policy User Rights Assignment setting, then you will need to install the Group Policy Management Console feature on the machine which hosts the local account, and edit the group policy from there. This will allow you to resolve the local account details! If you are using AADSync, then the randomly generated AAD_xxxxxxxxx service account requires both ‘Log on as a service’ and ‘Log on as a batch job’ privileges for the machine on which AADSync is installed on. If you are using AADConnect, then the randomly generated account mentioned above is no longer relevant (thankfully!) because it no longer exists. The synchronisation service now runs under the designated Active Directory service account, which is useful =] This account requires ‘log on as a service’, ‘log on as a batch job’ and also ‘log on locally’, although I’m not 100% sure why ‘log on locally’ is actually required. If ADFS is being installed, then the ADFS service account will require ‘Log on as a service’, as will the account ‘NTSERVICE\ALL SERVICES’. This last setting is done in order to allow the WID database for ADFS to work properly. If this happens to you during the installation of ADFS, then your culprit will be the logon as a service rights! Go into the properties of the Generate Security Audits section and add the ADFS service account into here. If the option to add an account is grayed out, then that means that a Group Policy is controlling this access list, and you will need to find and modify the appropriate GP to add the ADFS service account into the group (usually the Default Domain Policy). While you are here, ensure that the ADFS service account has ‘Log on as a Service’ privileges. Once this is done you should be able to start the ADFS service (although if you edited Group Policy then run gpudpdate first). Hopefully this helps you before you get to the point where you make the ADFS service account a Domain Admin! Remember, this account only needs Domain User privileges and should not be put into god mode!